Ever since Smith Micro bought StuffIt Deluxe, it has been making the famous archive creation and management tool look better and better. 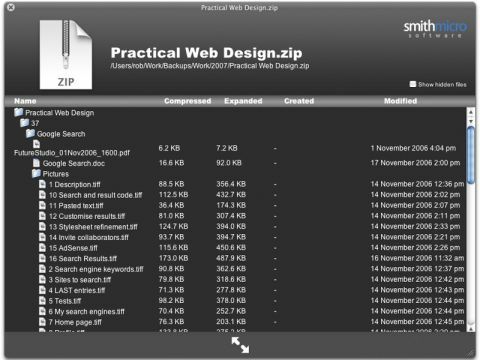 StuffIt Deluxe 2009, able to handle everything from its own .sit and multi-featured .sitx formats through .zip, .rar and internet faves .uu, .hqx and .bin, is undoubtedly the best yet, thanks to a variety of improvements. contextual menu plug-in allow you to compress and expand archives without launching any programs; and SEA Maker lets you create archives that self-expand. There are other features, such as Automator plug-ins and command line tools, that help power users with their workflows, too. New in 2009 for Mac OS X 10.5 Leopard users is Quick Look integration, so you can see inside an archive's contents in Finder, Time Machine and Mail, for example, without having to expand it (although it didn't seem to work so well with .rar archives). By installing Google's free MacFUSE file system implementation mechanism, you can mount archives as disks in Finder so that you can browse them, save to them and extract files from them as though they were a hard drive; the interface isn't instantly obvious, though. You can now create different preferences for DropStuff with different drag zones, so you can drag files to different areas of DropStuff and have them compressed appropriately. There's also support for scheduling compressed backups to your iDisk. And if all of this cost £20 or £30, it would be worth it. But at $80 (£46; £18 to upgrade), and cheap storage the full StuffIt Deluxe 2009 is a luxury the vast majority of people can afford to be without.